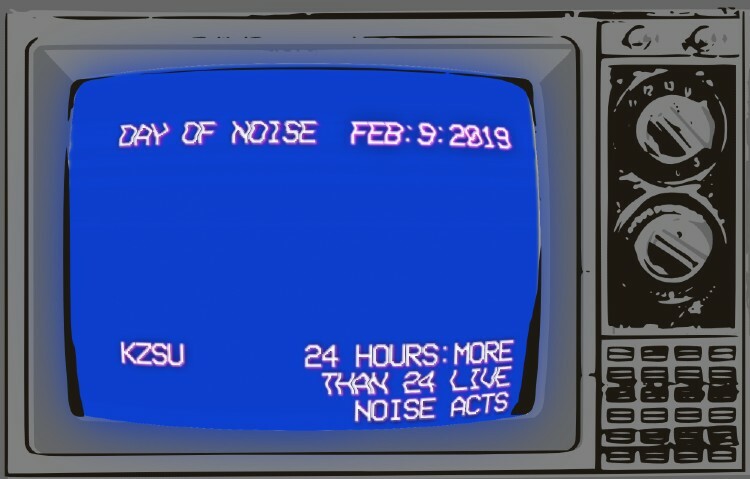 January 17, 2019 ~ Craig M.
It’s here again: The KZSU Day of Noise, 24 hours of live noise/improv performances, broadcast across the free airwaves, streamed over the Interwebs, and stored for posterity on YouTube. From midnight to midnight (Pacific time) on Saturday, February 9, 2019, musicians will be performing live at the KZSU studio, playing laptop electronics, analog electronics, acoustic instruments, electric guitars, and whatever other noisemakers they decide to bring. Artists will perform for 30 or 60 minutes apiece. See the full lineup here. In the Bay Area, tune in to KZSU on the good old-fashioned radio at 90.1 FM. Elsewhere in the world, stream the show live at kzsulive.stanford.edu. We’ll probably have a live video feed running as well (in the past, it’s been on YouTube). The last few Days of Noise have been archived on the KZSU site in both audio and video forms, so you have plenty of material to get acclimated for the big event. We have loads of fun putting this on every year, and I’m so grateful to the KZSU staffers who make it happen. Abra masterminds the whole thing — many thanks to her for keeping the idea alive — while Smurph does the bulk of the audio engineering and Jin documents the event in video and photos. Other DJs like me chip in where they can, moving gear, delivering food, giving directions over the phone. And the musicians have loads of fun. Please do tune in, any way you can.